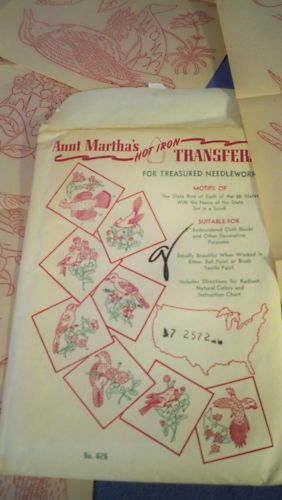 What does Martha Stewart have to do with my first quilt? I can’t remember for sure when it happened but someone gave me one of her magazines to look at; I think there was a flower article that they wanted me to read. 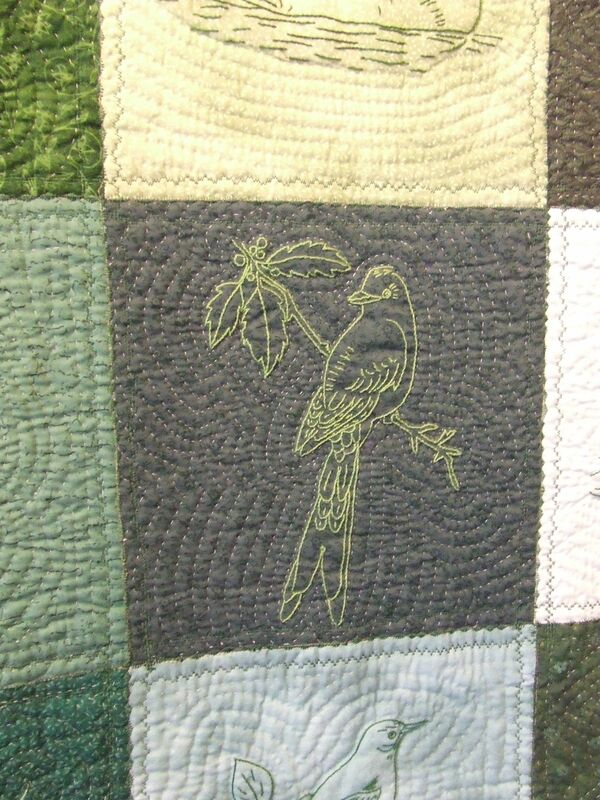 There was also an article about making a quilt with state birds. I went back to that article much later (in an effort to organize my desk, I had to look at the magazine before I tossed it) and decided to give it a try. 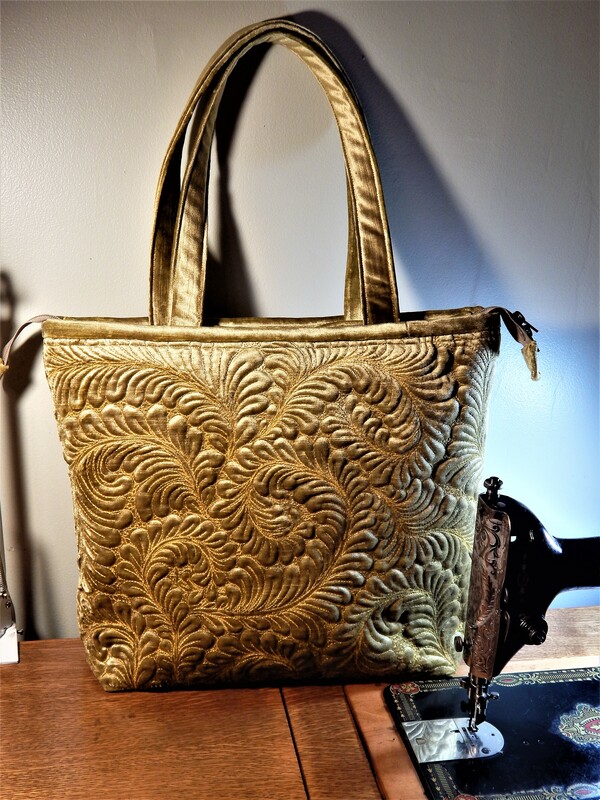 I had done embroidery before….how hard could it be? 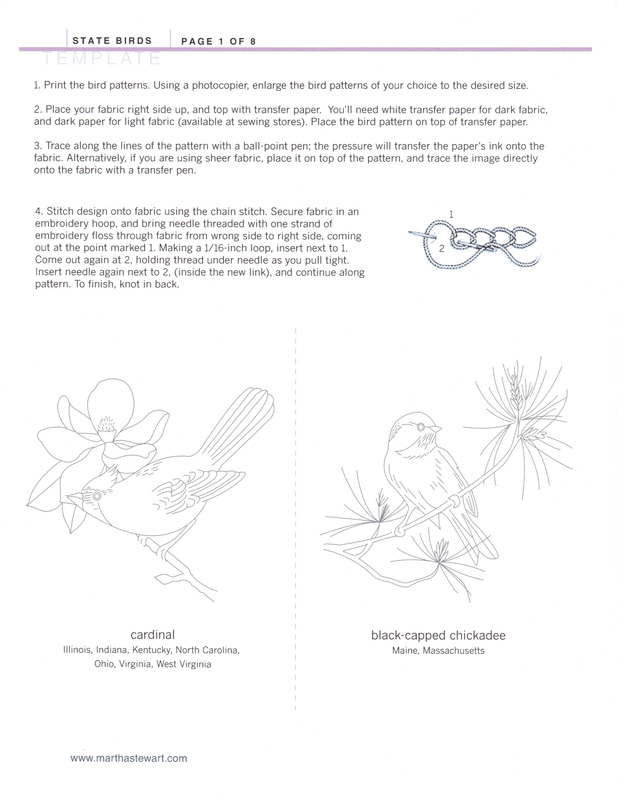 There was a bird for each state (actually several states have the same bird so there aren’t 50) and I neglected to embroider the state name with the bird which I now regret. I went to the fabric store, decided the color I wanted, bought a few fat quarters, and some DMC floss and went at it. The instructions werent that great (at least at the time I didn’t think so) so I had to figure out how to transfer the pattern to the fabric, but I got that worked out. 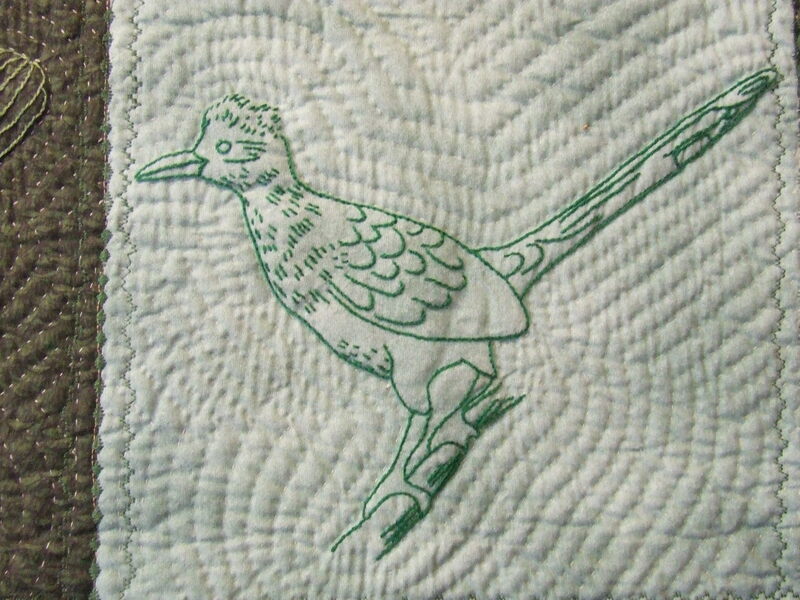 Every few days I was back at the store buying a few more fat quarters (each bird got a different fabric and different floss) and I’m sure the clerk thought I was nuts (perhaps she was right). 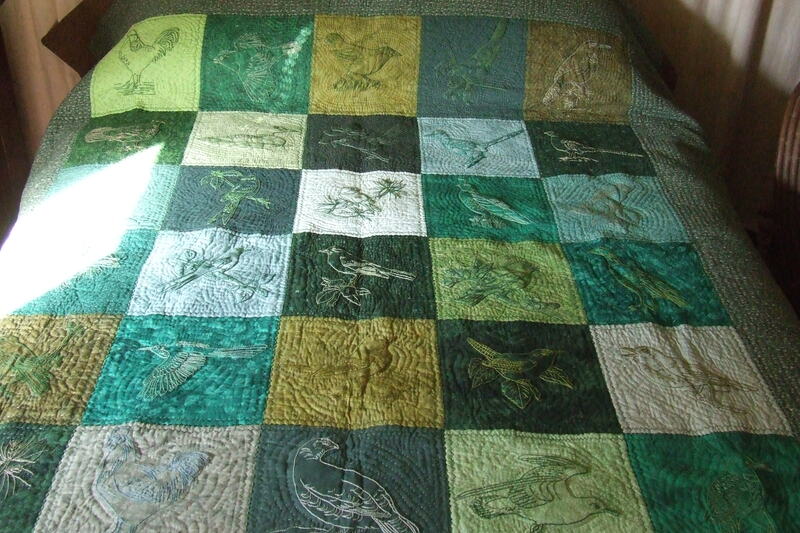 I got all the birds finished, cut the blocks down to 12.5 inch squares, sewed them together, added a border and was ready to make it into a quilt. So back to the directions. 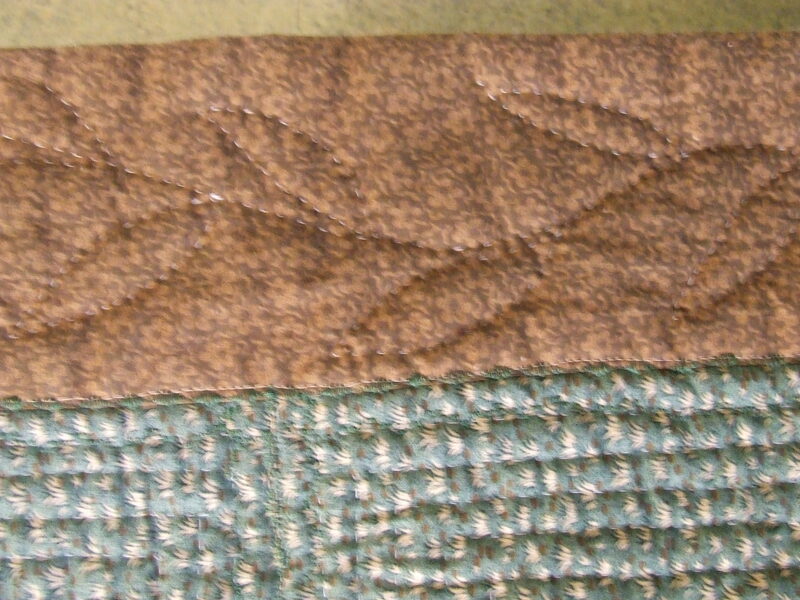 They said to layer the backing batting and top, and then sew between the blocks (stitch in the ditch) and then fold over the edges to make a binding. OK that made sense to me, so I went to buy batting and backing fabric. I selected brown backing fabric (which would also become the binding). For the batting I had no idea what to buy, so I read all the packages and made a huge mistake! 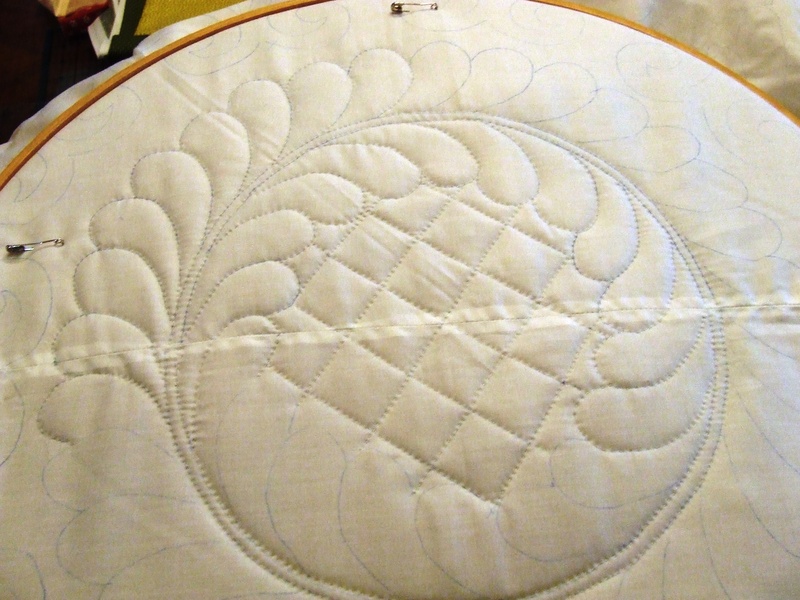 I bought June Taylor polyester fusible batting, seemed like a good idea at the time, that cotton batting seemed so thin! 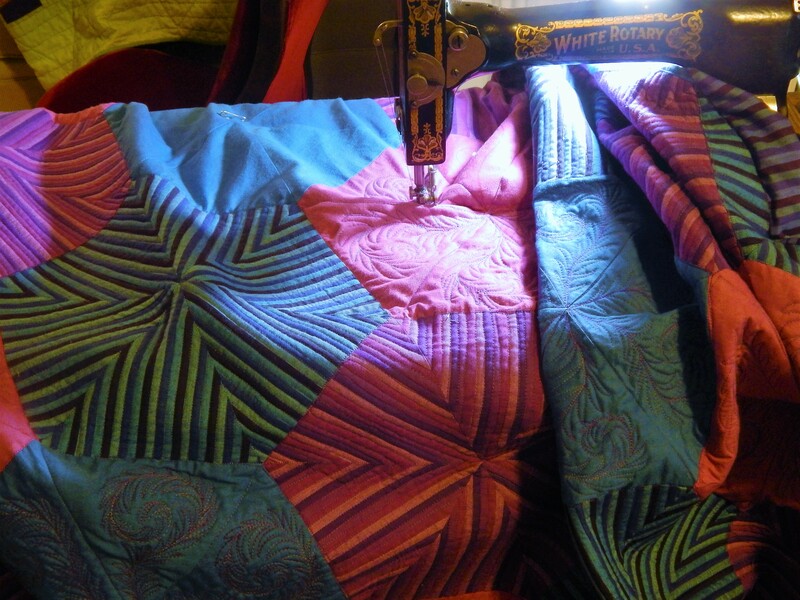 You are theoretically able to press the quilt layers together with the iron rather than basting, which I did. They do stay together untill you try to run the thing through a sewing machine with out a walking foot. What you get is a bunched up mess, and more puckers than I care to remember. 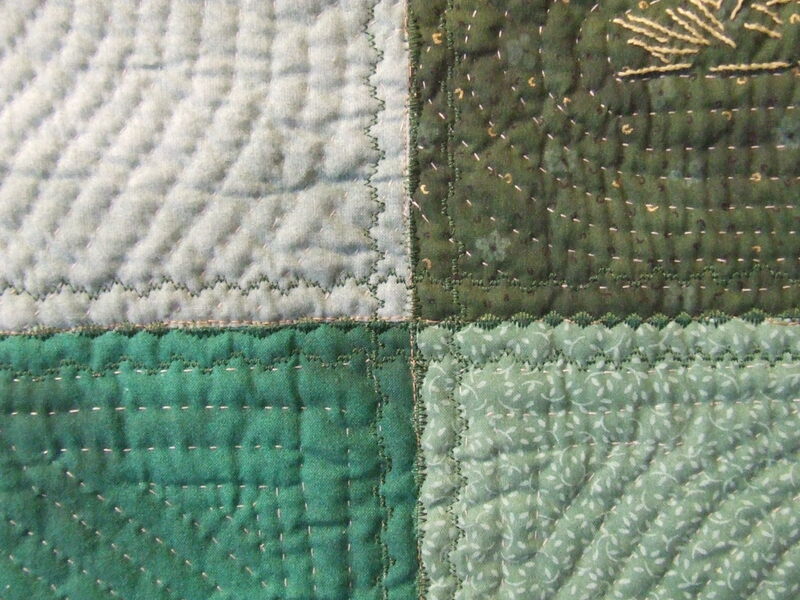 After it was all together, puckers and all, I decided that maybe some decorative stitching would help flatten it out so a ran decorative stitching up and down the blocks on the machine. 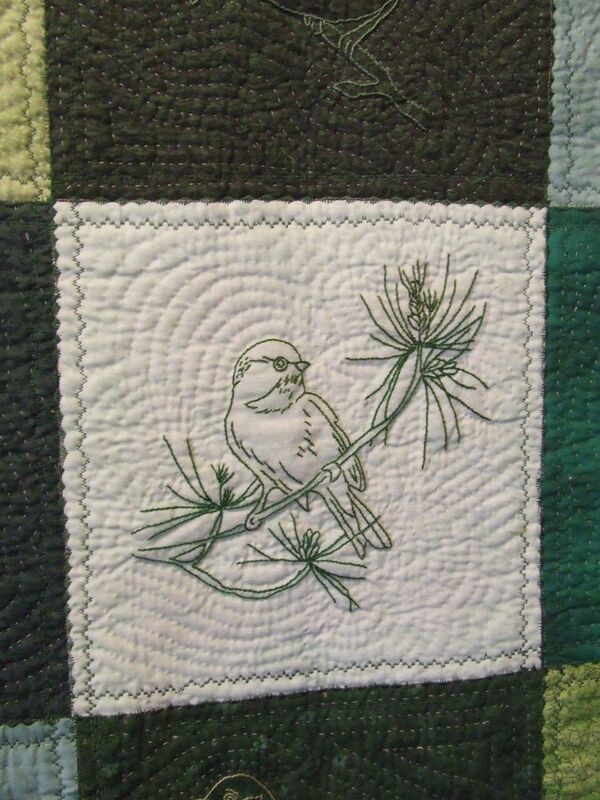 The quilting came much later so only look at the machine stitching for now. 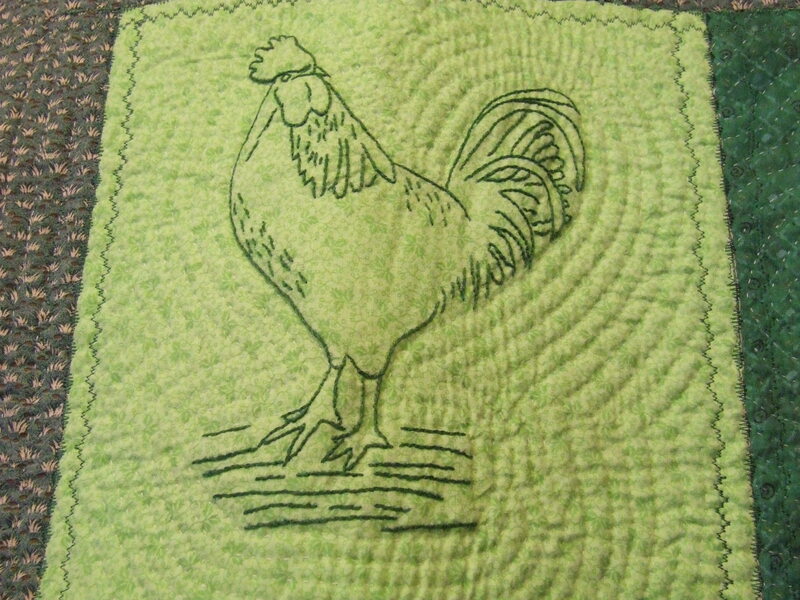 I still hated it, decided I had wasted a lot of time and fabric, had a huge pile of scrap fabric from all the blocks and the backing, and had an ugly quilt. Some other time I will post about how to do the rug. 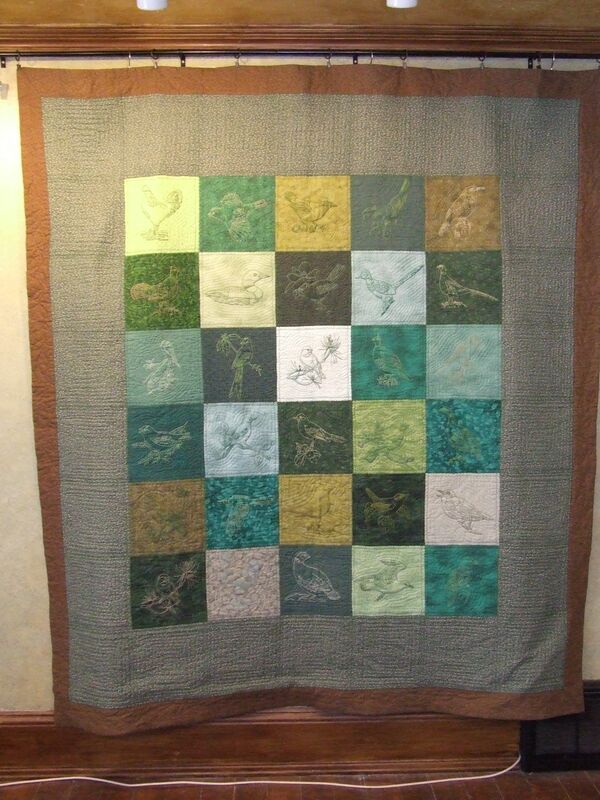 After the rug was done (I added a lot more fabric than just the quilt scraps) I decided to do something with that quilt. 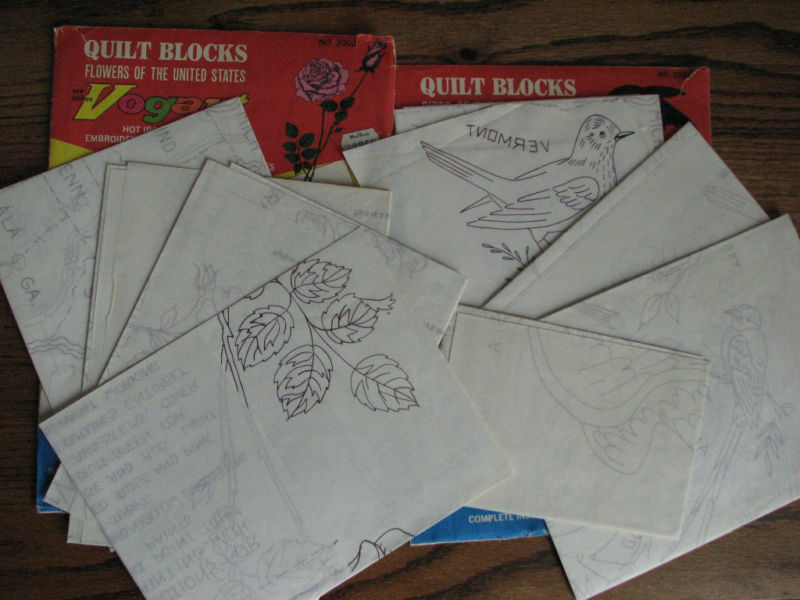 I had no Idea how to quilt so I looked it up on the internet. 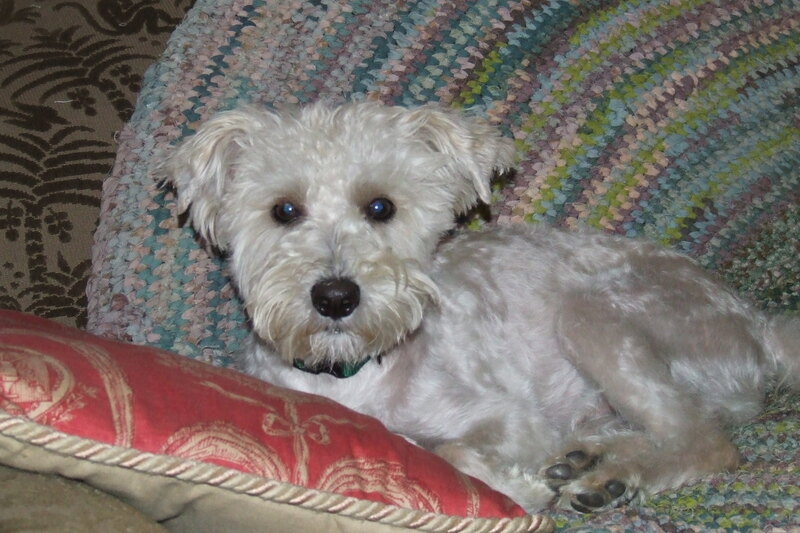 It looked easy (silly me) so I jumped in but lacked an important item, a thimble! My fingers were raw and bleeding (I still can’t find a thimble that fits…apparantly manufacturers don’t believe that men might appreciate a thimble large enough for our fingers). I now make my own with leather. 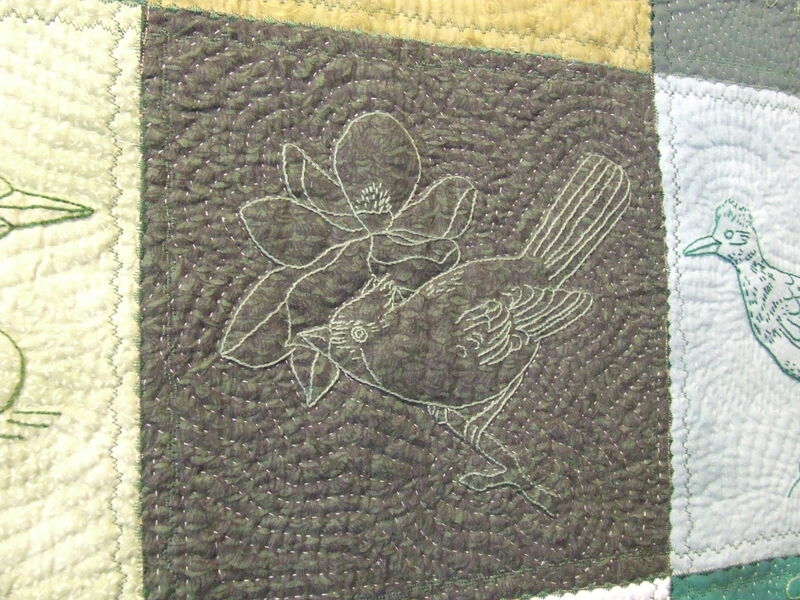 I did echo quilting (at the time I didn’t know that is what it was called) around each bird, amazingly that took out all the extra fullness and made a huge difference. Here is where I have to comment again on fusible batting. 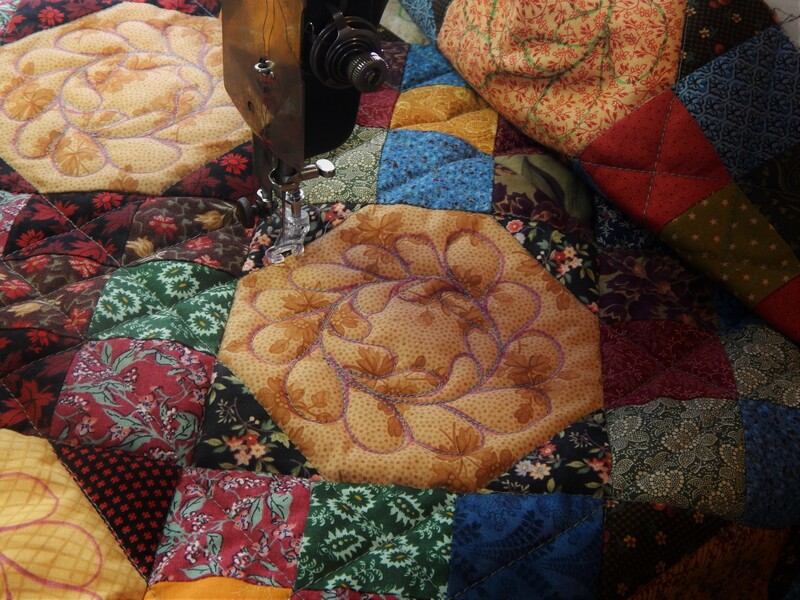 The quilting was a much harder job because there were hard crunchy parts in the batting, presumably where the fusing glue was heavier. I can’t tell you how many needles I bent trying to get through that glue. 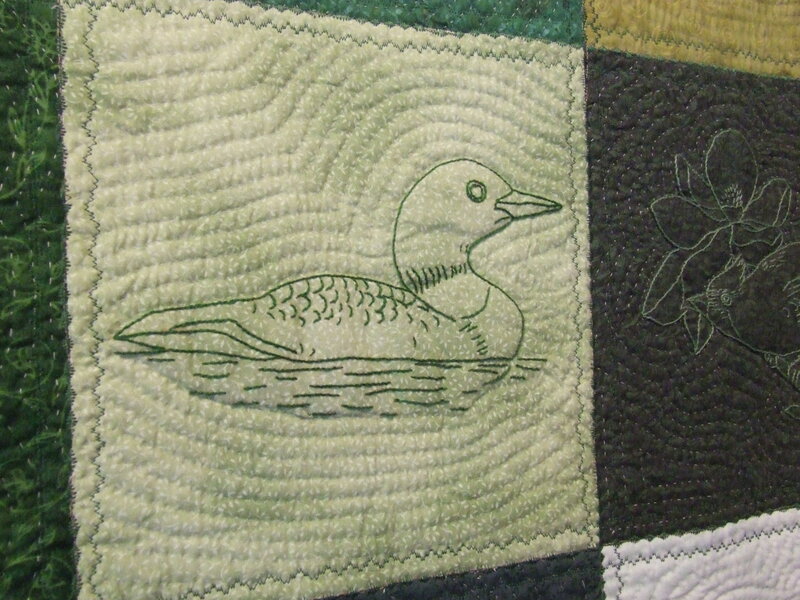 In the end I like the quilt, and once washed the crunchy glue came out. I have a set somewhere that I bought from eBay, it has 50 states so that helps to date it . I have seen sets that have only 48 states but can’t remember who published them. Anyone that knows I would love to hear from you.